Today was the last day of school. I know the summer will pass by quickly. Do you ever feel like your day is so busy, but you are still not getting anything done? Yup, this is me today. Getting used to kids being at home now, and keeping up with everything else I have going on. 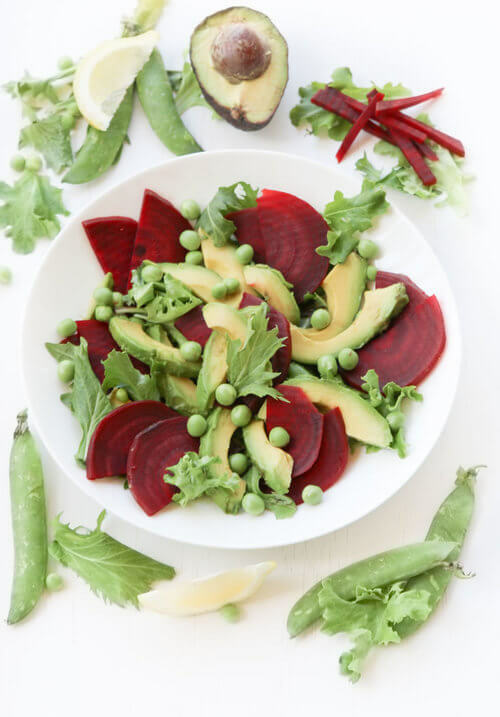 These kind of moments calls for a salad, and not just a salad but a quick avocado beet pea salad. It's not only easy but nutritious too. Some nutrition avocados contain is serotonin which boosts your mood. Beets are good for eating if you need an energy source (hint, hint, this salad can be perfect before a workout). Don't forget the peas because this vegetable is low in calories and is high in fiber and protein. Definitely going to make this salad more often, knowing all the great health benefits. Boil 1 red beet for half an hour, let it cool. Peel and slice beet and 1 avocado. Add to 1/2 cup mixed greens. Take peas out of the pods and add to the salad. Drizzle vegetables with 1 1/2 Tablespoon extra virgin olive oil and juice from 1/2 a lemon.